Home » English Graded Readers » Level 3 » Party Time! Everyone likes parties! In this book, there are six stories about parties. Teresa is studying English in London. The school will have a welcome party for new students. Teresa is excited, but she doesn’t know what to wear. She asks her teacher, but she misunderstands the information. When she arrives at the party, she has a big shock! Barbara wants to have a party before her wedding, but there is one problem. She doesn’t have any friends. Her co-workers, Kirstie and Maddy, decide to help her, but will the party be a success? 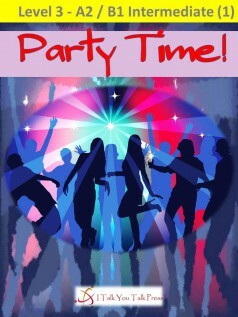 Enjoy these great stories and three more in Party Time!